Will you be in the Seattle area this weekend? The first – and we hope annual! – Washington Artisan Cheesemakers Festival is being held at the Seattle Design Center on Saturday afternoon. Featuring 20 Washington cheesemakers, the event gives enthusiasts the opportunity to meet the artisans and learn more about what makes their cheeses unique. And – *ahem* – taste one or two along the way. Foodtree is delighted to help the festival by providing technical support – including providing QR Codes for the tasting booths to help the new fans find where to buy their favourites! Mt Townsend Creamery, one of the larger Washington producers, has just recently opened up a tasting space in Pike Market. They are perhaps best known for the soft-ripened Seastack, which uses vegetable ash ahead of ripening. It’s a popular offering and graces the cheese plates of many a fine restaurant around Washington and beyond. Mt Townsend's Seastack is dusted in vegetable ash prior to ripening. Golden Glen Creamery, out of Bow, WA, sources milk from their own herd of Holstein, Guernsey and Jersey cows to make their range of artisan cheese. In addition to their farm store, you can find the cheese at Alder Wood Bistro, Madison Park Conservatory and many small grocers and food coops around Washington. River Valley cow and goat milk cheeses can be found across in specialty grocers, PCC and Whole Foods in Washington. One of their most popular is the Naughty Nellie raw milk tomme – a cheese that has been bathed in local Pike Brewery’s ale of the same name. Not only is their raw milk artisan cheeses winning several awards, they also offer cheesemaking classes to try your hand at it at home. And what is a cheese tasting without something to help wash it down? Local breweries, wineries and cideries will be on hand to advise in pairings, and artisans are providing bread, crackers, jams and sweets to accompany the cheeses. If you’re heading to the Washington Artisan Cheese Festival – Why not grab our free iPhone app and snap a picture to keep track of your favourites? And look out for me – I’ll be there the afternoon, snapping pictures and learning a thing or two myself! Saturday 7th April 2012, 12pm-6pm. 21+ only. Buy advance tickets here ($35) – limited tickets will be available at the door $40. Price of admission includes cheese tastings and 3 drinks for beer, cider or wine. The team here is just back from a week in San Francisco, and would love to invite you out for a local Vancouver event on Thursday night! 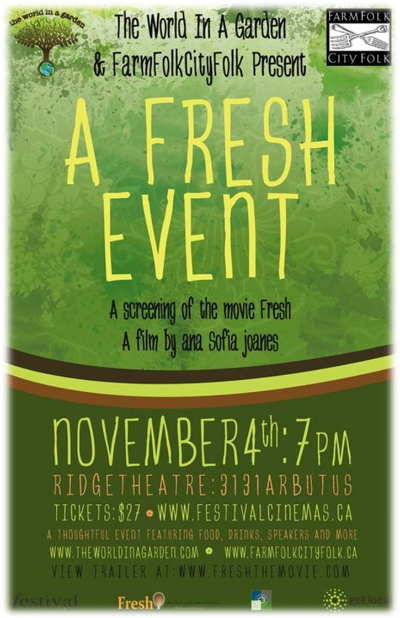 Come out to see FRESH, a film by Ana Joanes which is making waves and seeding a movement in thinking about food. You will be watching our feature film, FRESH, www.freshthemovie.com and it’s an excellent watch! You’ll be supporting the work of 2 great organizations that make local food happen: www.farmfolkcityfolk.ca and www.theworldinagarden.com. Enjoy complimentary Artisan Gifts Bags valued at over $50 with Home Grow-in Grocer and Terra Breads gift certificates, antipasto by Tower Foods, Cocolico Chocolate Sauce by Wendy Boys, JB’s Candy Store home-made caramel popcorn, a Green Zebra coupon book and a Nature’s Path Granola bar! Taste the goodness of fresh and local preparations from our generous sponsors: Windset Farms, Rocky Mountain Flatbread Co., Vij’s, Terra Breads and Edible British Columbia. Experience the flavours of our Farm to Table liquids including: Farmstead wines, Crannog Ales, Dao Tea and Ethical Bean Coffee. There are Door Prizes to be won! Raffle items include gift baskets from: Seeds of Plenty, Ethical Bean, FarmFolkCityFolk, Edible British Columbia and Choices Market. The first 200 people to purchase tickets online will be entered to win 2 tickets to the 2011 Feast of Fields www.feastoffields.com ($190 value) and we’re almost there so get online today to order! Know more. Eat better. Foodtree is a service that makes it easy to share detailed food and food source information with friends and neighbors, bringing food communities closer to the people feeding them. Foodtree is a one stop shop for food businesses and food lovers interested in deep insight into the food they make and eat. Using our fully integrated web and mobile products, food businesses around the world are sharing their story with food lovers looking for a deeper connection to their food. Foodtree Media is a Vancouver company focused on putting useful food information at people’s fingertips.